Studio Verticale - Channel Ctr. St. Project - New! Header Menu Portfolio Boston Projects Channel Ctr. St. Project - New! Goal: Bathroom remodeling, guest room updates, new doors. Custom solutions for stairs treads, work area and kitchen storage. The clients behind what turned out to be a series of multi-faceted projects came to us through a referral from another client couple in the building. The initial goal was to replace the wood floors on the main level with wider plank Italian wood floors and to organize second floor guest room, upgrading all doors and adding a slider over the guest room entrance opening. The slider had to also double as a statement piece as it would be the first object one would see upon reaching the stairs to the second floor landing. Lighting was also addressed as part of that project with multiple track lighting & spot lighting components added throughout the second floor. The guest bedroom was completely redone with new storage components in white, glossy glass, working in tandem with the white, glossy, lacquered slider at the entrance. All interior doors were also replaced with white, satin, lacquered doors with inlays to complement the new theme. What followed was a quest to find a suitable replacement finish for wooden staircase treads and to design a custom work station with storage. It was a happy coincidence that right about then one of our Italian suppliers, Alfa Scale, launched a new cement-resin finish for stair treads, which we thought would be perfect next to concrete walls of the building. We proposed the finish and received instant approval. The design for the office niche was developed in conjunction with the Sangiacomo design team. Second floor master and guest room bathrooms were at the core of the next project, in which we were also tasked with creating a storage piece to fit under the staircase on the main floor. The storage piece had to complement the existing kitchen and work with the staggered line of the staircase. We used a modular wall system for wine storage from Modulnova to achieve that. Modulnova components were also used in both bathrooms on the second floor: suspended vanity cabinets, counter tops with integrated sinks, mirrors with lights, wall storage cabinets, cement-resin shower base & a sliding door glass enclosure in the master bathroom. 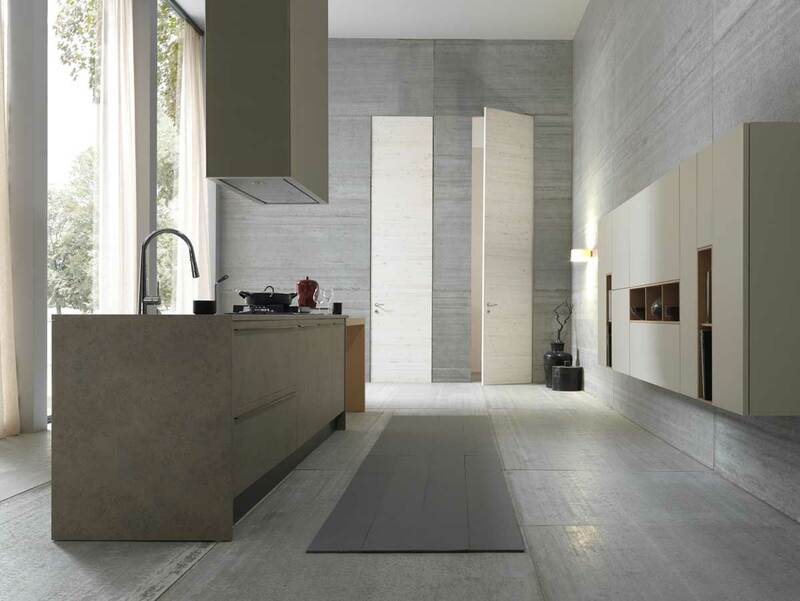 Wide plank wooden floors and baseboard on the main level are from Garofoli parquet collection. Interior doors are from Garofoli Gidea collection. Guest bedroom white glossy lacquered slider with a floor lock is by Casali. Guest bedroom wardrobe and storage are by Pianca. Custom 2nd floor office niche is by Sangiacomo. Cement effect resin stair treads are by Alfa Scale. Bathroom vanities and storage components are by Modulnova. Lea Ceramiche Italian tile in both bathrooms.